Given ZA, ZB, JA and JB, Eqs (11.61a,b), (11.62) and (11.63) are to be solved for X, Y, U and V.
Figure 11.19 shows a calculated phase diagram, with coexisting, equilibrium phase concentrations [B] on the ordinate and [A] on the abscissa3. The locus of equilibrium points lie along the curve, which is called the binodal. The region below the curve represents a single homogeneous aqueous phase containing polymers A and B (in this case dextran and polyethylene glycol, or PEG). Solutions with overall compositions lying above the binodal (e.g., point q) split into two phases, whose compositions lie on the bimodal, point n for dextran-rich phase I and point m for the coexisting phase II enriched in PEG. These three points.lie on a tie line, and are designated as q = [A]tot, [B]tot, m = [A]„, [B]„ and n =[A]i, [B],. 3 Ref. 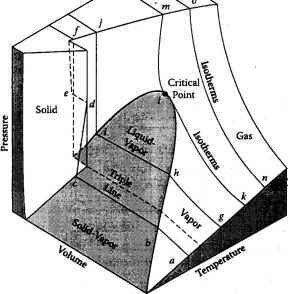 2 presents the phase diagram without giving the details of the calculation substance. All points on the binodal lying to the left at point s give the composition of B-rich phase II, and the points to the right of s characterize A-rich phase I. This equation gives the same value of f as either of the two ratios in Eq (11.60). In the second step in Fig. 11.19, an inorganic salt is added to the two-phase mixture of water - polymer A - polymer B in order to enhance the distribution coefficient of the protein. 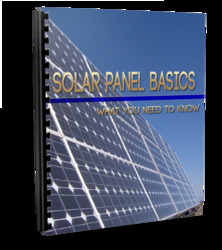 Before addressing this problem, two issues are examined. 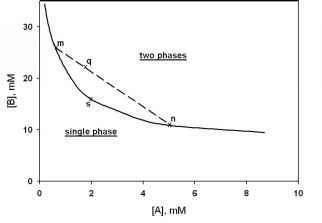 The first is the effect of the added salt on the phase diagram of Fig. 11.20. In general, the salt alters the activity coefficients of polymers A and B from the salt-free values described in terms of second osmotic virial coefficients (Eqs (11.54)). The dextran-PEG polymer solutions are little affected by the addition of a variety of salts up to concentrations of ~ 0.1 M (see Fig. 3.17a of Ref. 4). The quantity in parentheses is the difference in the polymer-B concentration in the two coexisting phases. The coefficient bS is a function of the electrolyte and its concentration. ,n dextran-PEG systems, bS for KCl, is -2.6 M-1 for a total salt concentration of 0.5 M (Ref 4, Fig. 3.22). The bS value for ammonium sulphate is ~ 20 times that for KCl. Owing to their similar chemical natures, bS for NaCl is probably closer to that of KCl than to (NHi)2SO4.